We enjoy hearing and feeling our voices blend in unison and in harmonies. We find rehearsals calming or energizing, depending on our need when we walk in. We make friends, and our relationships are deepened by the work we do together. 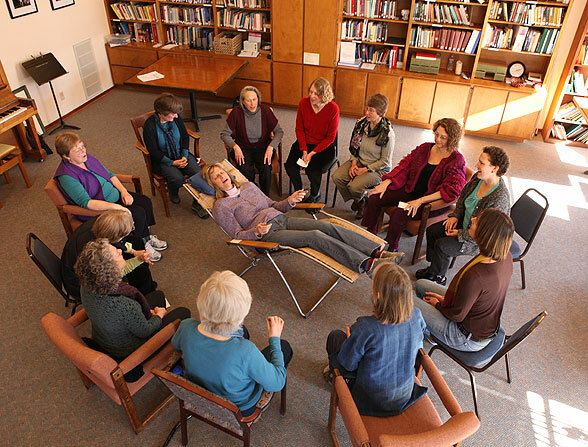 For some, Threshold Choir is a spiritual home or an extension of other spiritual practices. We often find ourselves singing the songs to ourselves away from rehearsal. I thank you for the gift of song that I have received through Threshold Choir and the greater gift of being able to connect with others through the songs. They are my form of prayer—I have a half-hour commute to work in the morning, and I never listen to music on the radio. I make my own. Today I went to visit one of my hospice patients. When I got there, she was asleep. I decided to sing softly to her for a while since I had gone all the way over there. I was singing softly with my eyes closed, and suddenly I realized I didn't hear her light snoring any more, so I opened my eyes, and she was awake. She had tears in her eyes and said she thought it was so beautiful and such a wonderful way to awaken. Four years ago, my father died at my childhood home. Threshold Singers were there to send him on his way with soft harmonies. I was unglued and astounded by the experience of this, and for me, the rest unfolded in perfect balance. I returned home, immediately found the Threshold Choir there, and, from that day forward, have celebrated (and beautifully mourned) my father's living and dying. Threshold Choir is a soul-enchanting experience for me. Music is my main connection to spirit, and my singing with Threshold women has crescendoed that belief for me. I have always loved to sing, and adding the service of singing at the bedsides of those dying or being born has brought a whole new dimension to the art. Singing to Ellen, our first client, was like singing to an appreciative angel, even on the day of her death. We were keeping peace with her spirit. At times I felt very much in the way of the hospital staff, but not when I saw Ellen’s face while we sang to her. We were comforting her soul. People have sometimes confided in me that they would be afraid to sing at bedside or, as choir members, that they would be afraid to be the leader at a bedside singing. What I have discovered is that there may or may not be apart of me that is afraid, but the fear is of no consequence. I am completely aware that what happens is simply what happens and is therefore perfect the way it is. With no attachment to outcome but only a commitment to the work itself, I have no expectations and nothing to desire control over. I realize that if I could approach everything in my life with this lack of fear and lack of attachment to outcome, my life would be transformed. I hope to have the grace to remember this as I become aware of resistance and fear in other situations. Being in the choir has not only "given me a voice" but also now provides this wonderful breakthrough in my perspective on life. I have sung with Threshold women to welcome a new baby girl into the world. Parents and friends all gathered in the backyard while we sang as part of a loving ceremony to say hello to a new soul, Tembani. The feelings of joy were shared by all who were present. Tembani may not have a conscious memory of the afternoon, but her presence brought a lot of loving people together to share the beginning of her life in harmony. I was able to hold my father-in-law and sing to him, just the two of us, hours before he passed. I haven't ever had this opportunity and remembered how you coached us to be as close as a mother nursing a baby. I did this. His eyes burned into mine and the room got as still as an exhale for a time. It was such grace! He and I weren't able to connect in any other way, verbally or emotionally, until that moment. Before I was in Threshold Choir, my father died as I was holding his hand. Not long afterward, I saw an article about Threshold Choir in the newspaper; I reread it many times, cut it out, and saved it. At the time, I was not a singer and still had unresolved feelings about my father's death, so the possibility of my joining such a choir seemed remote. However, within a year or so, I had both taken up singing and been diagnosed with breast cancer, and thus was facing the prospect of my own death. A while later, when a friend asked if I'd ever heard of Threshold Choir, I was ready. that we are literally on the same wavelength. with the power to move ourselves and others.